This small original painting was created in 1936 as the end of a series of sample designs for Mr. Masao Morikawa. Mr. Morikawa was the Secretary to the President of Doshisha University in Kyoto. He was both a long-time friend of Rakusan and also an important and influential patron. Morikawa was to select a design from the series to be adapted as a woodblock-printed winter holiday greeting card. Morikawa liked the basic design of LK3-11 (see link below), but he requested modifications to the composition and more color. In the revised version LK3-12 the angle of the viewpoint remained almost the same, but it was shifted closer to the building. The passers-by in front are entirely different as well. Rakusan also changed the proportions slightly in order to accomodate his winter card stock. 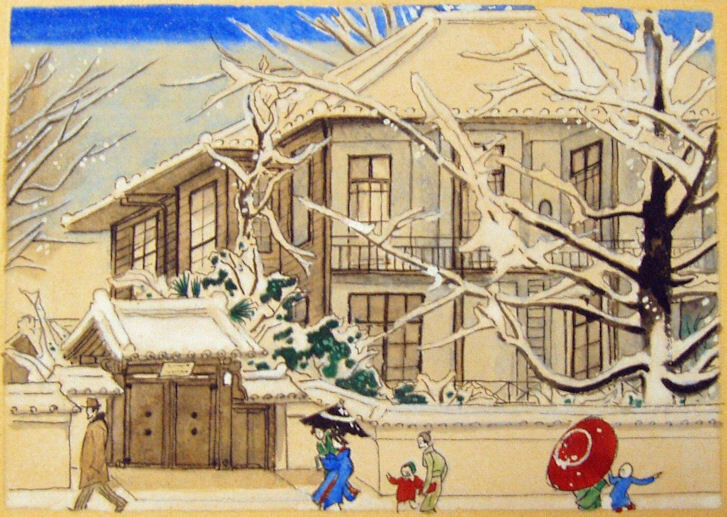 The improved LK3-12 was the eventual model for the woodblock print winter card WC2. Because LK3-12 is simultaneously both a member of its painting series and also the prototype for a woodblock print, it has two numbers. In its role as a woodblock print model it takes its other numbering from its woodblock print, WC2-0. Because this series of paintings was never intended for distribution, none were signed or sealed. This series of paintings was retained in Rakusan's personal collection. The prototype paintings for the larger woodblock print series were the same size as their prints. However, because of the quite small format of the winter card prints, Rakusan painted LK3-12 (and LK3-11) roughly twice the size of the corresponding published print. Friend Peace House, フレンドピースハウス furendo piisu hausu is a historic building owned by Doshisha University. Its name is taken from Basic English, a simplified version of English sometimes taught by early missionary teachers. It houses international students and foundation offices. The building was originally built as a home for a missionary in the late 19th century across the street from the eastern edge of Kyoto Imperial Park. The property also extends to the next street to the east and today there are entrances from both streets. In 1936 Doshisha University was planning on selling the property (which is near but not part of the main Imadegawa campus). However, Dr. and Mrs. Theodore Richards of Honolulu bought the property with the idea of renovating it and presenting it back to the university. They paid for the renovation and repurposing of the building and provided an endowment from their foundation. Friend Peace Foundation of Hawaii commemorated its 25th anniversary and the 60th anniversary of the founding of Doshisha University in 1936 with the Richards’ gift. The building which still stands was renovated again in 1997 and was registered as a Material Cultural Asset on March 2, 2006. The Richards Friend Peace Scholarship is still offered to Christian students in the Asia-Pacific region through the Hawaii Conference Foundation. Therefore, Friend Peace House is also called Hawaii Ryo, ハワイ寮 hawai ryou, 'Hawaii Dormitory'. As part of his Doshisha duties, Morikawa handled much of the dealings with foreign visitors and potential donors. The magnitude of the Richards' gift (and the need to advertise and acknowledge it) no doubt led Morikawa to chose this subject for his 1936 card. All of the Rakusan views of this building are of the more elegant west entrance which faces the park. In the LK3-11 version more of the building and plantings are shown. However, the addition of color and a closer viewpoint makes the final version showcase the building better. Notice that the man walking to the left in LK3-12 is omitted in the woodblock print version WC2 to make room for a woodblock-printed Rakusan cursive signature.